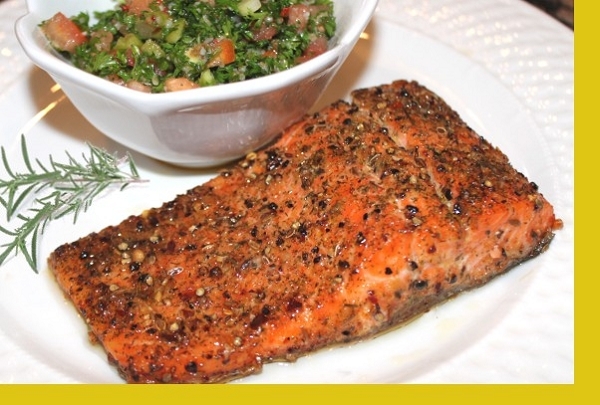 Perfectly seasoned Salmon baked to perfection in 20 minutes. This healthy and nutritious dish is served with a side of vegetables. I have loved all of the salmon dishes we’ve ordered from Maria but this has been my most favorite! My picky 4-year-old is even starting to like salmon because of our yummy Maria meals! Ordered two servings and my husband said it was delicious and we have never gotten a bad meal yet. Veggies were perfect. I made a salad and bread and it was more than enough. As I said the salmon was delicious. This really is my favorite dish. It is. Never was much of a salmon eater until now. 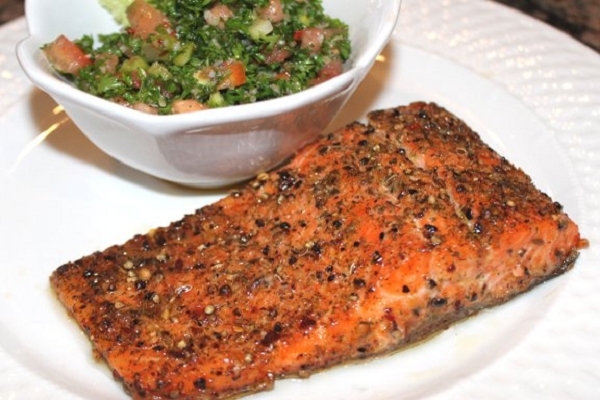 Salmon is nice and moist, flaky and simply melts in your mouth. Plus I love the mixed veggies and the oil and seasonings used. Yum. We just ordered this again! I must admit, this was the first meal I ordered from Maria and I order it every time it is available. We all love it! The Salmon was just delicious with all the peppery spices & was so moist! A perfect meal Maria! Easy to cook and fun to eat! Very delicious! He's not very fond of fish but thoroughly enjoyed this entree and vegetable dish! My granddaughter and I loved it. The veggies were great. Really great. Easy to prepare and delicious to consume. You could tell everything was fresh and well selected. portion size quite appropriate. The only thing missing would be a dessert. Definitely a 5 star meal. I have always enjoyed this meal and every time it's getting better! I've had both of the salmon dishes and while both were very good I would have to say this one is my favorite. It is crazy good! Another great dinner Maria. Perfectly seasoned, and delicious dinner ready in 20 Minutes. Better than 5 star restaurant! Thank you.